The major problem with food on Paradise Island was the exploitation resulting from being on an island. Someone referred to it as feeling like a captive extortionate!) Even reliably consistent Starbucks skimped on the amount of coffee used for cappuccino. Throughout the US I routinely use 2 packages of sugar per cup and here one was more than sufficient. And this was the only half way decent coffee I found in our five day stay. I was not alone--there was always a long line. Nobu, located in one corner of the casino was mostly a disappointment. I thought it would be a fantastic choice since I love his restaurants in New York and LA and given the availability of fresh fish I thought it would be really special. But when asked, they were quite honest about the fact that it was all flown in! Actually the conch sashimi was local and excellent. And the charming Hawaiian executive chef gave us a complementary tasting of eel: Sweet water, salt water, and wild (anago and two type of unagi). This was the highlight of our eating experience in the Bahamas. The sweet water variety was, of course, the most delicate, the salt water the most intense, and the wild salt water the most intriguing. I also had one exquisitely silken piece of toro sashimi for $20 while people around me (probably the high rollers) were ordering what was purported to be the signature dish: 6 slices of toro topped with thin rounds of hot fresh green chili peppers (which no doubt overwhelmed the delicate flavor of the tuna) for $90 a plate. Makes me think of patting a soft angora cat only to discover unsheathed and unexpectedly sharp claws lashing out to confuse the experience. Most of the rest of the food, on and off the island, was coated in a batter--even the french fries. Most disappointing were the much anticipated conch fritters. Tasty but not a single one contained more than one tiny piece of the conch. The Bahamians are lovely super friendly people and happily one advised me where to eat off Paradise Island in Nassau--a place called "The Poop Deck." We returned twice to have the local snapper, delivered straight off the boat twice daily. We tried it grilled and also deep fried. Grilled was the winner though both were excellent. Fish this fresh is hard to come by and it was a major treat. Twice we had the spicy rice and peas side-dish, which I loved, and the third time the battered potatoes that were delightfully crispy on the surface and fluffy inside. The coleslaw was excellent--not too much mayo and very fresh. The grouper fingers, however, looked too heavily battered to contemplate. For dessert, the frozen lime pie was lovely--not too sweet and light in texture. I was hoping to love the ubiquitous rum cake but it was, to my taste, hideously irredeemably sweet. 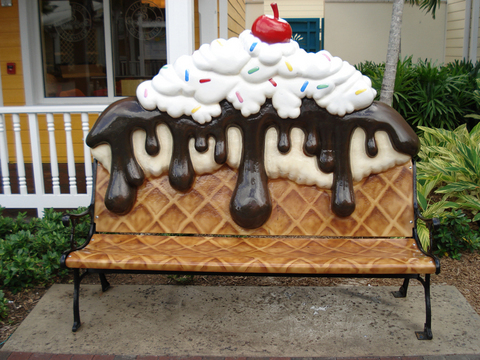 I offer this photo of the bench in front of the Paradise Island ice cream parlor as the best metaphor (can a photo be a metaphor?) for the tone of the resort. Though I'll admit to thinking it was kind of cute in a hokey/grotesque sort of way. The ice cream served inside was good except that by the time one got to the end of the line to pay it was either melted or consumed, and eating ice cream while smelling antiseptic disinfectant is not worth the calories. Of course if they hadn't used it the smell of tropical mildew or worse wouldn't have been an improvement. On our return, the Nassau airport was a continuation of the appalling overcrowding--actually worse. Flights were over-booked and delayed. 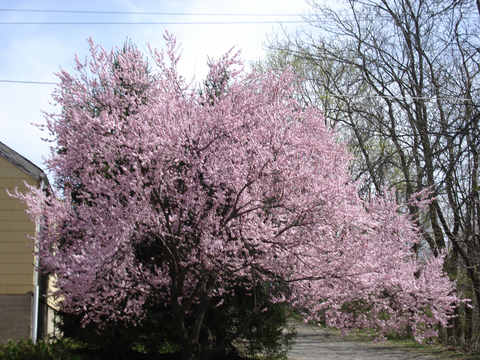 Weekend home to New Jersey cherry blossoms and other flowering trees was a delight. Never has home seemed sweeter.